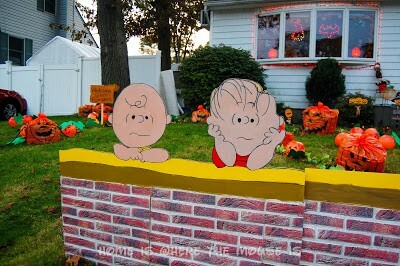 I love decorating for Halloween. Some might say I go a little nuts… but in a good way, of course. 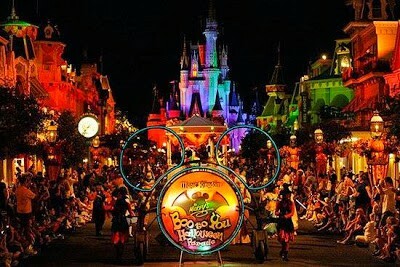 As a Disney fanatic, I draw a lot of inspiration from the creative genius behind Disney’s awesome displays. Here are 5 tips I’ve learned from the experts. 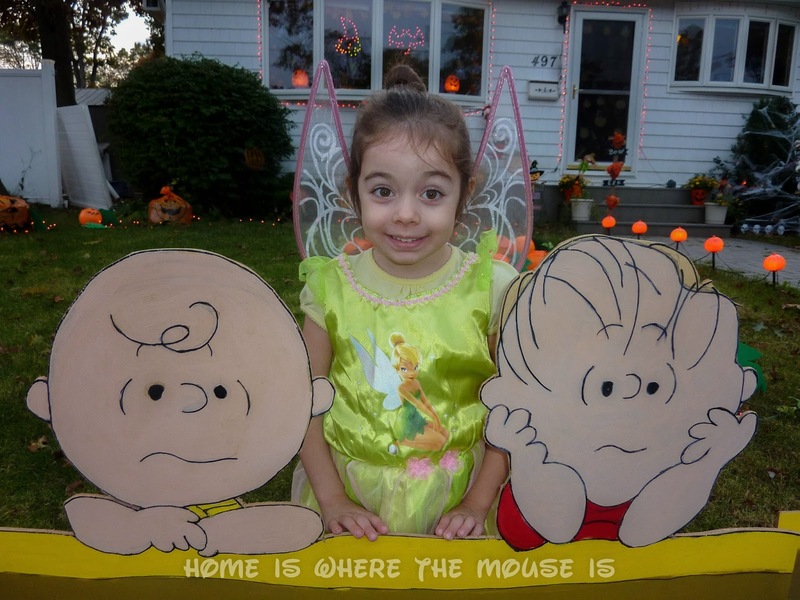 We’ve yet to be able to visit in person for the Halloween season, but that doesn’t stop us from living vicariously through the Internet. 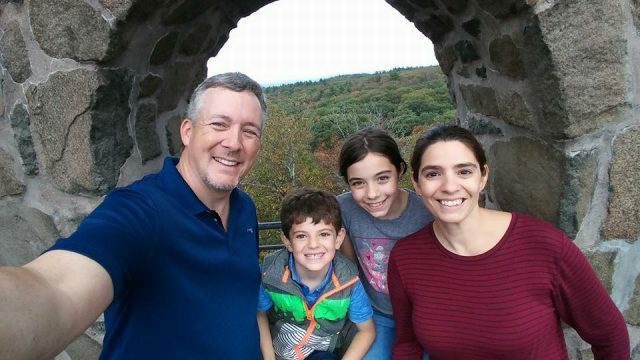 Thanks to our friendly DisDads who’ve shared some of their pictures with us! Each tip also has a video clip to help illustrate it! Almost all of the clips are from Disney! The most overwhelming moment for me when I begin the process of decorating our home for Halloween is when I go into the garage and I stop and stare at all the props, lights, and things I’ve got stored in there. Taking it all and just throwing it out on the lawn would certainly be the easiest way to go about it, but it wouldn’t look that great. 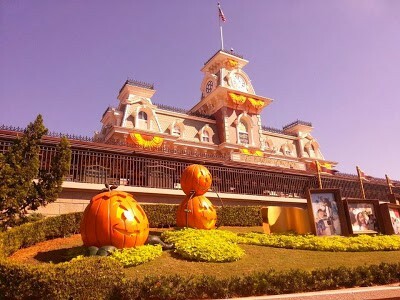 Imagine if Disney just took all of their decorations (they have more than you do) and put them anywhere and everywhere. It wouldn’t be quite as magical. So have a plan. Choose a single theme, or a few themes with designated areas for each one. Check out this video of the park being transformed overnight. 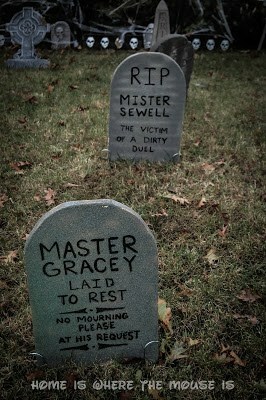 and the other is my Spooky Graveyard. Having these defined themes helps me to keep my focus, especially when I am shopping or trying to think of new ideas. If it doesn’t fit one of these themes, I don’t get it. Next year I’ll have to create a cool time lapse video of the setup! 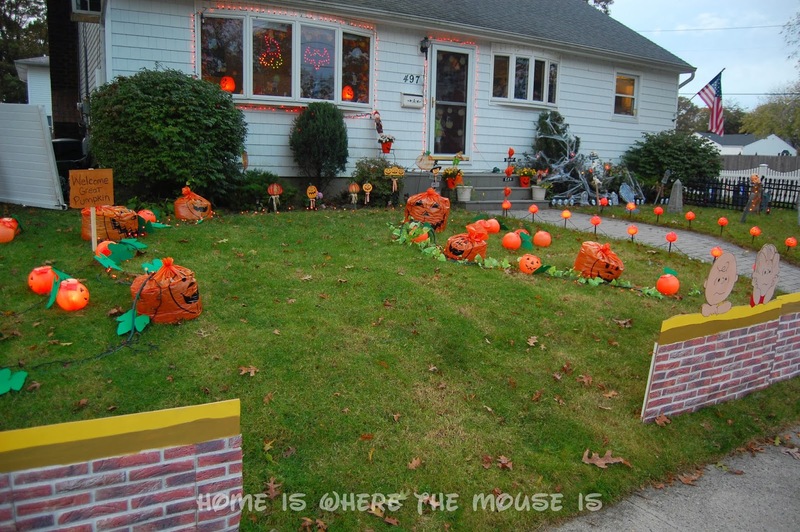 A surefire way to make your Halloween display stand out is to be unique. 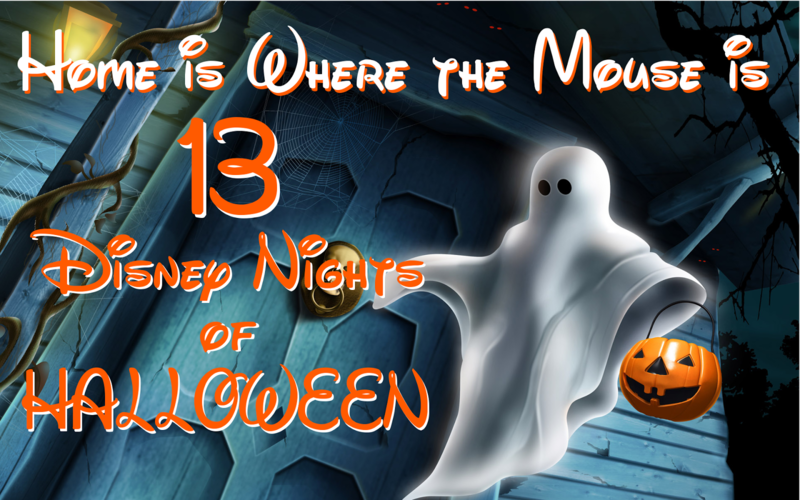 There are a lot of great props and items for sale in the stores this time of year, but you’re not the only one buying them. Take some time to create something unique, or find a way to use a store-bought prop in an unexpected way to set yourself apart. It doesn’t necessarily take a team of Imagineers and a Disney sized budget to create something really cool. Here are some tips from Disney. My pumpkin patch is mostly made up of cheap trick or treat buckets that I purchased for less than $1 each. Pumpkin leaf bags and cheap plastic pumpkins create the patch. 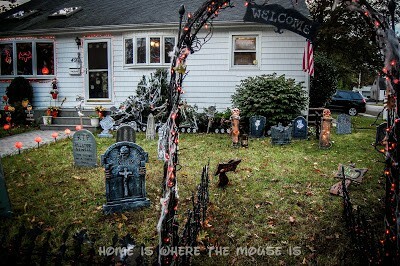 There’s always a few houses in our neighborhood that choose to go over the top in a gory, bloody, hideous way with body parts strewn about the yard or hanging out of windows. Some even go as far as to hide on Halloween and jump out to scare Trick or Treaters. I love a good scare as much as anyone, but in my experience your average family out for Trick-or-Treating doesn’t appreciate it. So it’s just my opinion that the best displays keep it family-friendly. I think it’s evident that Disney takes the same approach. 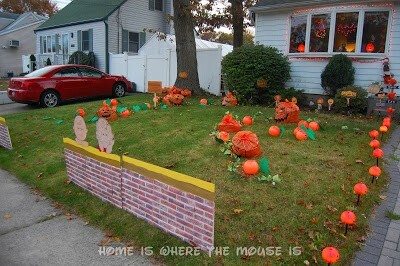 You’ll notice that all their Jack-o-Lantern’s are smiling! The Disney Parks youtube account posted this video of a Disney Fan’s display that keeps it family friendly. Kids especially love the pumpkin patch. 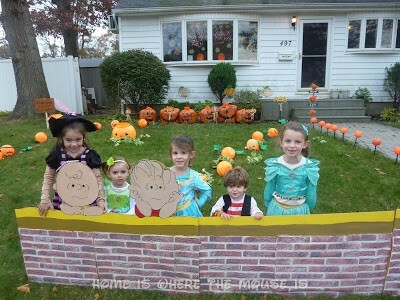 Many get their photos taken with our Charlie Brown and Linus. Nobody can transport you to another world the way Disney can. They do it so well because they pay such attention to the little details. They appeal to all of your senses and make you BELIEVE! All those little details, the sights, sounds, and smells come together to tell a story. 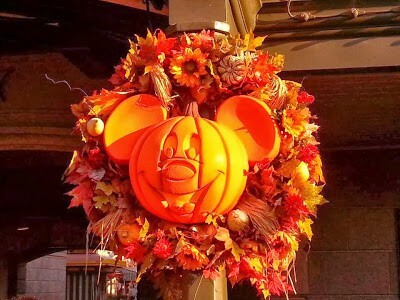 This video shows you all the different jack-o-lanterns Disney uses on Main Street, USA. 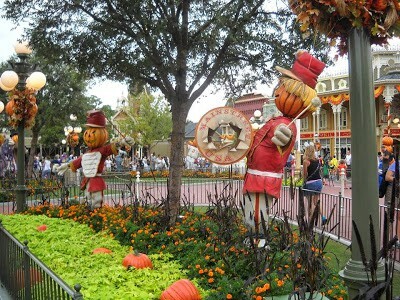 It’s not just about faces, but detailing the pumpkins to match the storefronts and help tell the story. I don’t have any music yet… but I’ve been trying to entice the kids to walk through the display to get to or from the front door when they come trick-or-treating. I need to work on making it more obvious. I leave a path through both sides for the kids to use to walk through the display. By day, your display will look one way, and by night, another. What good is it if all your hard work doesn’t get seen because it’s too dark? Making good use of lights can help create the right mood as well as make your display enjoyable at night. Here’s a guest video that I’ve cued up to show how the decorations look at night. 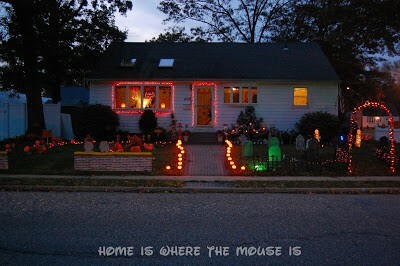 Lighting up the pumpkins and adding colored floodlights to the buildings adds to the overall effect. Orange lights give it a festive feel at night. 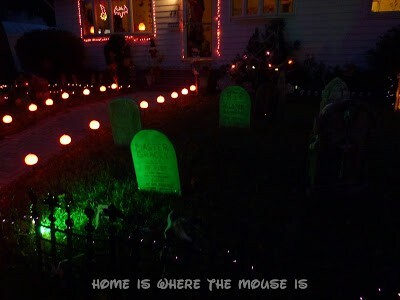 Green floodlights help add a spooky feel to the graveyard at night. 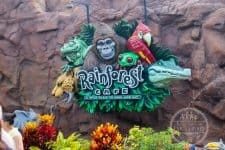 Each year I try to add a little bit more, and every trip to Disney, and every Disney video I watch, and every picture I see that is shared of all their great decorations only inspires me even more! Maybe one day I’ll be like the Baus family! 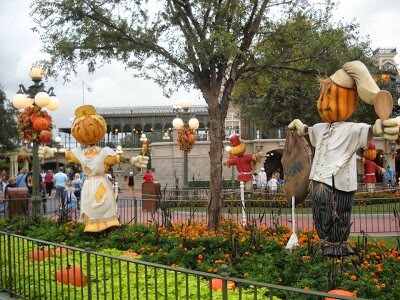 So tell us, how does Disney inspire your Halloween Decorating?